To be successful when fishing for very wary carp you may need to come up with a completely new tactic in order to fool them into taking your hook bait. One tactic I have used frequently is what I call the trick rig. 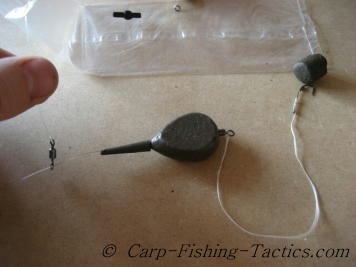 I had the idea for this carp rig from a book written by top carp angler Martin Clark. His book showed a few very novel ideas for rigs but they seemed very complex to make, so I changed a few parts of it and adapted it into a simple form. The trick rig works on the principle that the hardest carp to catch seem to be able to eat all of our free offerings but adapt at avoiding the actual hook bait. The idea is to present an obvious danger bait to the carp so they purposely avoid it but then eat the surrounding bait with confidence. The hook bait is will be hidden amongst the surrounding baits ready to catch the bigger and often most cautious carp in the lake. 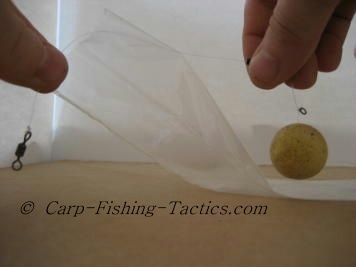 Detailed pictures and instructions on how to make the Trick Carp Rig. 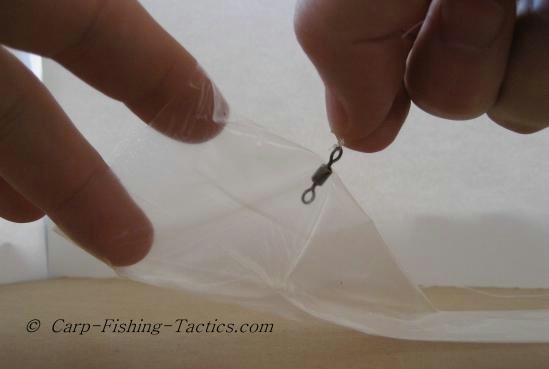 Start by making a pop up boom using stiff mono line. Tie a standard swivel to one end, on the other end thread on a big pop up boilie. I often go for a 28mm boilie, this is because I don't want any fish to actually take the pop up. Many carp will naturally be wary of such a big, blatant bait and small fish will not be able to get it in the mouth. If other nuisance fish like bream try to eat the pop up they may spoil the presentation of the rig. 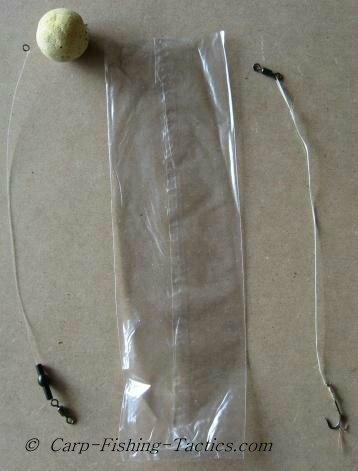 Once the pop up is on the boom tie something on just under the boilie to stop the bait sliding down the boom. In the picture I tied on a small rig ring because I was trying out other tactics with this part but usually just a simple knot will do. 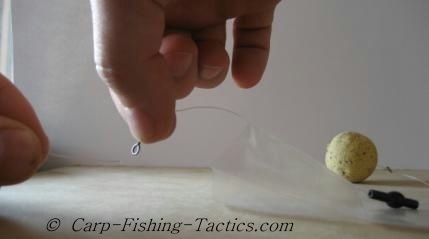 Open the PVA bag and cut a small hole in one side about an inch or two from the top. Now thread the swivel from the stiff pop up boom through this hole so the pop up stays out of the bag but the swivel is inside the bag. Now thread main line through the pop up swivel so now the PVA bag and the boom are attached to the main line. Now tie on the rig type you wish to use. I use an inline method for good hook setting potential. I do tend to use lighter leads as the rig will be fairly heavy by the time the bag is fully loaded with bait. This is one reason why I tend to use this carp rig only for short distance fishing.